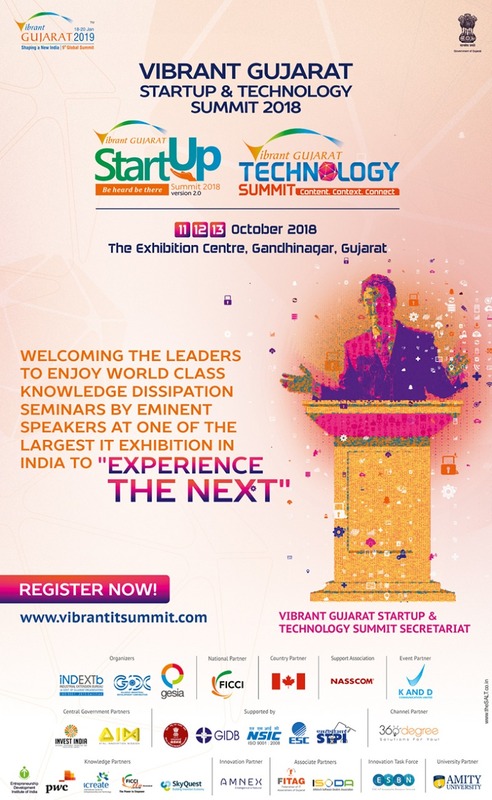 The Vibrant Gujarat Start-up and Technology Summit 2018 (VGSTS 2018) organised by Government of Gujarat – GIDC, iNDEXTb and GESIA IT Association held on 11-12-13 October 2018 at Vibrant Gujarat Exhibition Ground, The Exhibition Ground, Sector 17, Gandhinagar, Gujarat 382016. VGSTS 2018 a global event of National – International Stature focusing on “Next Generation Technology”, is aiming at providing the “Experience the Next” feeling to all it participants. This event brings together Start-up and Next Generation Technology on a single platform, the event is supported MSME, NASSCOM, FICCI as National Partner, Knowledge partner PwC and EDI. Associate partners were ISODA and FITAG. Event partner was K and D Communications Ltd. This event bring to the platform Idea, Innovation, Technology, Investment, Tech Talks, Academic – Industry research and Mentorship. The platform provided Business to Business Connect, Networking and more. An event which bring high value proposition to Companies, Employees, Associations and professional.